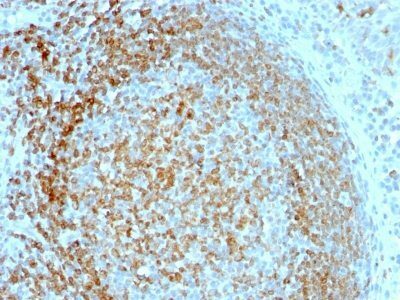 This antibody recognizes a protein of 30 kDa, identified as CD70. Raji cells. Lymph node or tonsil. This antibody recognizes a protein of 30 kDa, identified as CD70. It is a cytokine that belongs to the tumor necrosis factor (TNF) ligand family. This cytokine is a ligand for TNFRSF27/CD27. It is a surface antigen on activated, but not on resting, T- and B-lymphocytes. It induces proliferation of co-stimulated T cells, enhances the generation of cytolytic T cells, and contributes to T cell activation. This cytokine is also reported to play a role in regulating B-cell activation, cytotoxic function of natural killer cells, and immunoglobulin synthesis. Catalog number key for antibody number 1026, Anti-CD70 (TNFS7/1026) The prefix indicates conjugation, followed by the antibody number and size suffix.